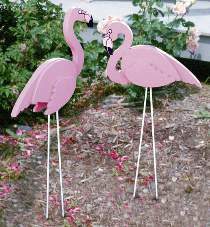 Beautiful pink flamingos for your yard. The center section is cut from a piece of "2x12" and the sides and wings are cut from 3/4" stock. The layering of wood gives a very 3-dimensional look. You get FULL SIZE patterns for both projects. Bodies measure 22" and 27" from beak to tail. Order two dome eyes and two fiberglass rods, available separately below, for each project you build.